The anniversary of the August 12, 2017 Charlottesville protest is coming up. It was on this day, so the story goes, that the left confronted the right over the right&apos;s support for a statue of civil war general Robert E. Lee and a woman was killed by a white nationalist driving his car into a crowd of Black Lives Matter, Antifa, and other protestors. Because applications by "Unite the Right" for a return to Charlottesville were turned down, the protest this year is scheduled for Lafayette Park, across the street from the White House in Washington. 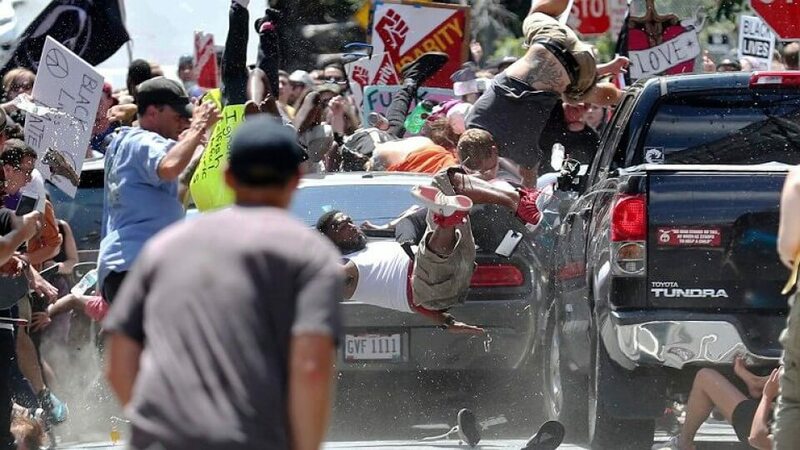 The ANSWER coalition, representing the left in the US who are to the left of mainstream Democrats, has called for an all-day "mass action" against Unite the Right, under the slogan, "NO Nazis, NO KKK in D.C."
Many of the events in our world today are not what they appear to be. "We create our own reality," said a senior Bush administration official. After September 11, 2001, it&apos;s not clear why anyone would believe the official story about any of the many political atrocities that have taken place in the world. But they do, because 99% of the news they read is controlled, and very little skeptical independent journalism is seen. Though some people may indeed have been beaten and injured in Charlottesville last year, the central action was probably staged. Evidence of this is that alt right and leftist activists are said to have gotten off the same buses when they arrived in Charlottesville. The police were told to do absolutely nothing to stop Antifa from attacking white nationalists. Two different versions appeared of the Dodge Challenger which allegedly drove into the protest. The driver of the Challenger didn&apos;t look like the same person who was later arrested. There was no blood visible at the site of the alleged homicide, where the alleged victim was supposedly mashed between two cars. One young man shown in the official video being flung up into the air by the speeding Challenger was seen in other footage hanging out comfortably afterward at the sidelines. He appeared to be a stunt man. There were examples overall of poor acting by apparent crisis actors. Are we really being threatened by the Nazis and KKK or is this a factitious narrative in a greater drama called "Divide and Conquer"? When the KKK actually was active, half their members were FBI infiltrators. If the so-called neo-Nazis didn&apos;t exist, organizations like the Anti Defamation League and Southern Poverty Law Center would have had to invent them. And perhaps they did. How are those in power going to divert us from their massive, worldwide crimes if they don&apos;t have domestic populations occupied with scary villains? Nazis and Klansmen certainly fit the bill. But there seems to be a lack of people willing to play the villain roles. A case in point was a rally against the right in Boston, also last August, in which an estimated 40,000 people came to shut down a conservative right speaking event at Boston Common which brought in twenty to thirty people, who ended up not even being conservatives. They carried signs saying "Stop Monsanto" and "Black Lives Do Matter" and featured an India-American speaker condemning corporate rule and supporting freedom of speech. Some of the participants were women dressed up in what looked like fairy costumes. Until the event was cut short, a constant roar of denunciation came from the massive surrounding protest. It was probably the most ridiculous demonstration in the history of liberal Boston. "Unite the Right" estimates that their event will bring 400 people to Lafayette Park on August 12. Why does ANSWER feel that this rally, even if it is what it claims to be, is something that calls for "mass action"? What about a mass action to stop to the provably dangerous people known to be active and holding actual power in other places in Washington D.C.? These people are threatening war with Iran, Russia, China, and North Korea all at the same time. They are the people who have been enabling Zionist genocide in Palestine, the people who destroyed Libya, the people who are encouraging Saudi Arabia&apos;s decimation of Yemen, the people who funded ISIS in Syria, the people who invaded and destroyed Iraq, the people who have ravaged Afghanistan for 17 straight years, the people trying to destabilize Nicaragua and Venezuela, the people who let Puerto Rico hang out to dry, the people who organized the racist prison and judicial system. Why has it fallen to the left to now be opponents of free speech, and to be diverted by a miniscule constituency on the right? If left leaders in groups like ANSWER are not indeed witting participants in a fictional script, this is more than pathetic. ANSWER has had nothing to say about who carried out 9-11. Why? This, the biggest of all the staged events in the century, has led to one war after another in a plan laid out by American neo-conservatives representing Israel. Year after year, the US has been funding and fighting wars against not its own but Israel&apos;s enemies, killing, displacing, and immiserating millions of people. Is this really the time to be chasing FBI agents masquerading as Nazis around Lafayette Park?